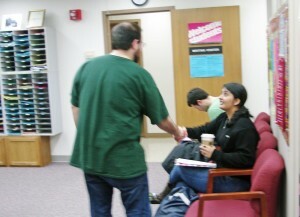 Greeting a student in the Writing Center’s waiting area. The UW-Madison Writing Center launched Another Word in the fall of 2009 to give the writing center community a space to talk (write) about writing. All posts are written by members of our Writing Center staff, by alumni of our Writing Center, or by invited friends from writing centers around the world. Another Word is copyrighted by the Board of Regents of the University of Wisconsin System, and does not accept advertising. You can learn more about our writing center on our website.